Do you have the urge to visit a Mediterranean Island? 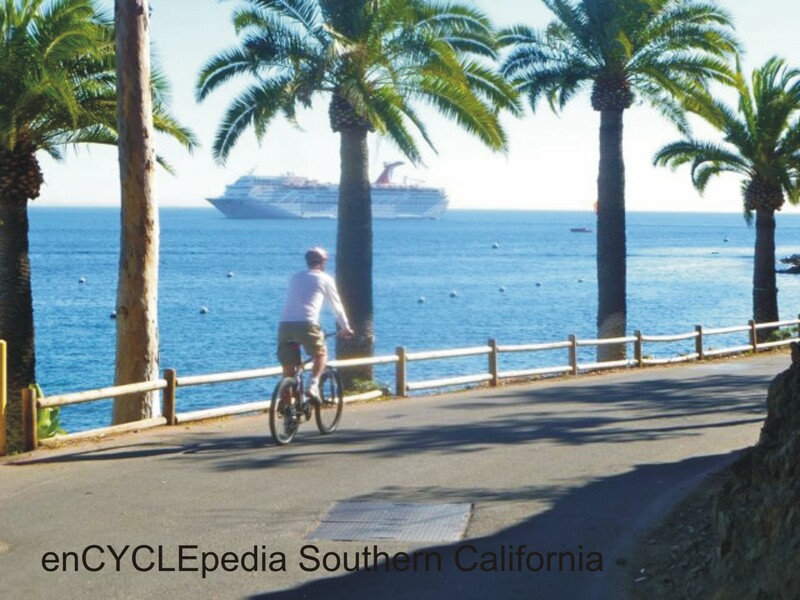 If you can choose a warm sunny day, which can happen any time of year, a visit to Santa Catalina Island can be a sublime experience. There is no car ferry to the island so the only vehicles are from the residents of the village of Avalon. Most get around on golf carts. You can bring your own bike, or rent from a couple of concessions. It’s a great way to get around, combining a bike ride with the other activities that range from mini golf to zip line to scuba diving. There are no shortage of shops to engage you and plenty of restaurants to savor. The 20+mile ferry crossing takes about 1- 1.5 hours from several ports in Orange and LA Counties, and accommodations range from high end B&B’s and inns to a campground. More adventurous mountain bikers can get a permit and cycle the length of the rugged 22-mile island. 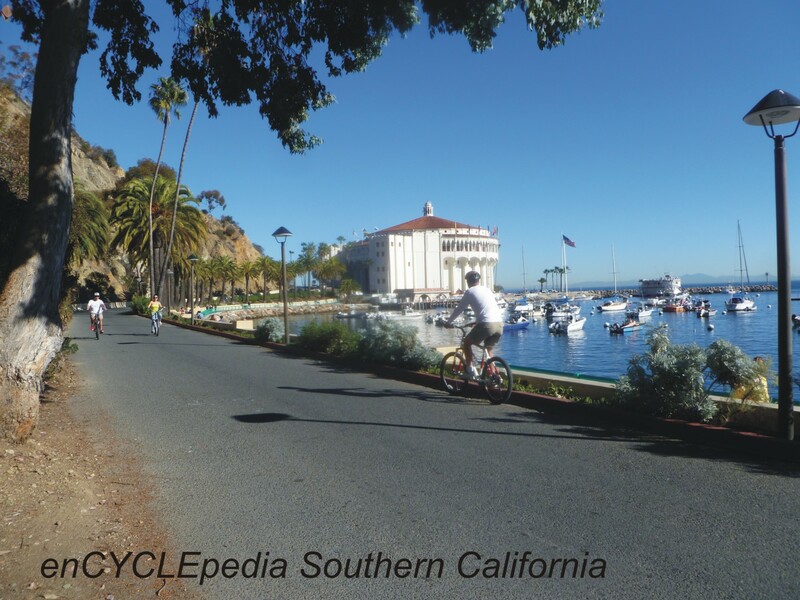 If Catalina has a theme song, it’s 26 Miles (Santa Catalina) by the Four Preps from 1958. Here is someone’s slideshow set to the song. Several miles of spectacular coastal riding await. Cycling toward Avalon on the coastal road. 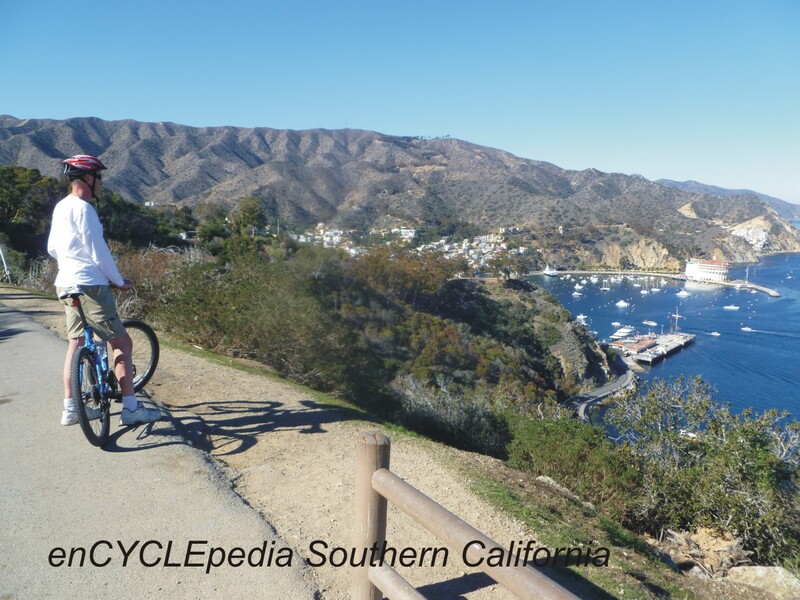 The reward for cycling into the hills surrounding Avalon is spectacular views down to the village and harbor. Some of the LA-Mexico cruise ships stop at Avalon, as seen from a scenic stretch of coastal roadway.